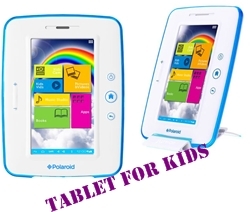 There are very few tablets in the market for kids because no one thought seriously about it, but there are some who have thought and developed tablets for kinds such as Tabeo tablet and now Polaroid has also come up with a tablet especially designed and built for kids. The Polaroid tablet is a seven inch with multi touch sensibility and is powered by Google’s Android operating system 4.0, system has a processing power of my GHz , 512 MB of RAM plus 8 GB of internal storage capacity even user can extend their tablet storage capacity as an SD card slot is also available, the tablet also includes a 2 mega pixel camera , WI-Fi connectivity. As we have already told that Polaroid tablet has been designed specifically for children’s needs, it has protection of liquid spills by side and rear bumpers together.